Just a half hour north of Mammoth is a gem of a winter resort that is earning a reputation for enhanced terrain. June Mountain is smaller and more intimate than its sister mountain down the road, but the scenery and the atmosphere are unsurpassed. As you climb to the elevation, you can look out over spectacular Mono Lake, volcanic craters, at he peaks of Yosemite and a valley straight of the Swiss Alps. While most people get their lodging in Mammoth and then drive over to June Lake, you may want to get your hotels in June Lake. Boarders can head to the JM2 Unbound Terrain parks on Schatzi and Sunrise, while powder hounds can wake up early to ski the Face. In between are wide open groomers - perfect for soaking up the sun, the scene and the breathtaking views. June Mountain's has also added terrain enhancement. Led by famed park designer Eric Rosenwald, "JM2" is expanding. Look for the pros like Matt Hammer, Sarah Burke and Tanner Hall in JM2's Super pipe and two parks. Fewer people and June Lake's smaller town means that JM2 has fast become the underground destination. 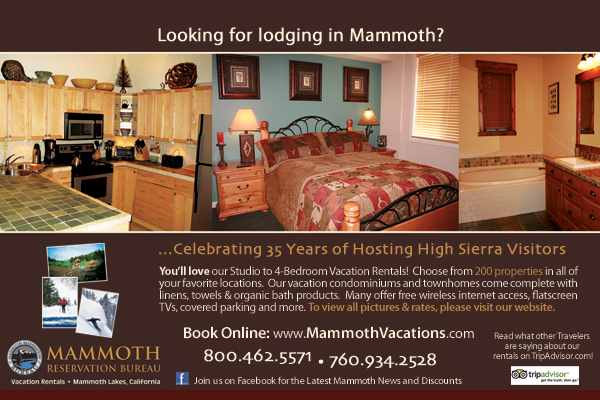 If you like bigger, with a bit more visit Mammoth City Concierge to get the details. The longest run is 2.5 miles with 20% Advanced, 40% intermediate and 35% beginner with 2 quads, 4 doubles and a hand tow pumping 10,000 skiers up the mountain an hour. Unfortunately, for the 2012- 2013 season, June Mountain is not going to open. Mammoth Mountain ski resort has made a financial decision to focus on their main resort. It is likely the resort will remain closed in the winter for a long time. But there is still a lot of things to do and see in June Lake during the whole year. You should check some of these out. There is more than just the ski mountain in June Lake. There is the infamous June Lake scenic loop which circles the entire lake area. You will drive by each of their lakes and you should detour to see the little homes, restaurants and shops that surround each lake. There is wonderful June Lake fishing and each lake has different flavorful fish. You'll want to get a tube, floater or small boat and go out and try your luck. You can also waterski on Grant Lake. It is the perfect size for jet skiing as well. However there are no companies at the moment that rent boats or jet skis so you do need to bring your own. And after you have fished with the June Lakes, you may want to go over and see all the lakes in Mammoth lakes as we have go 6 of our that you can drive to within 5 minutes, plus 3 more just outside of Mammoth. The word around here is "lakes" as in plural as there are even more that you can only hike to. June Lake and Mammoth Lakes are great places to float your boat!